“Peshmergas fight for Kurdistan but they also protect Western civilization and culture. They protect Christians too from another massacres” – Ryszard Czarnecki, the vice President of the European Parliament summarized his recent visit in Kurdistan Region in daily newspaper “Gazeta Polska Codziennie” on January 11, 2016. 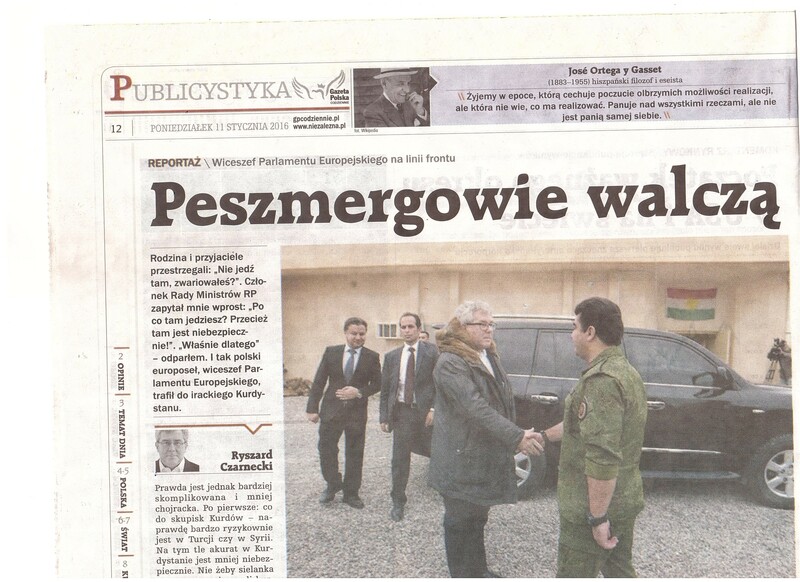 In his article, entitled “Peshmergas fight for us”, Mr. Czarnecki wrote about the programme of his stay in Kurdistan Region: meetings with president Masoud Barzani, Falah Mustafa – Head of KRG Foreign Relations, commanders of Peshmerga and visits the Peshmerga front-lines and refugees camps. With large knowledge of the Middle Eastern context he described current position of Kurdistan Region, as well as the similarities between the Polish and Kurdish nation. Mr. Czarnecki ended his article with important conclusions. He noted that Kurdistan Region does not receive enough of international assistance to maintain an extraordinary number of refugees and internally displaced people in Kurdistan. He stressed that if more help will be delivered to the Middle East, include Kurdistan Region, the less will be the exodus of refugees to Europe. Mr. Czarnecki praised and expressed his gratitude for KRG and Peshmergas for protecting religious minorities, including Christians and for political solutions in Kurdistan Region, which guarantee the presence in parliament of representatives of religious and ethnic minorities. The half of the article is available here (only in Polish).